Arena Stage begins the 2013-14 season with The Velocity of Autumn, a two-character play written by Eric Coble and directed by Arena’s Artistic Director Molly Smith. 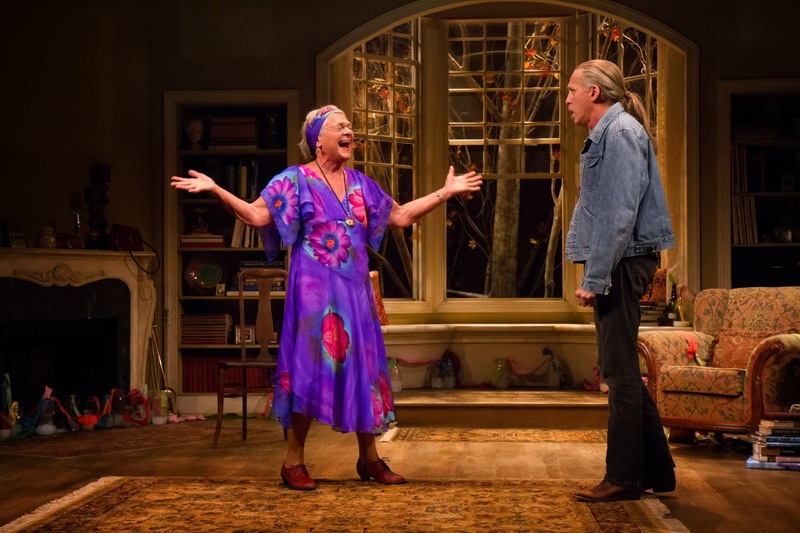 The Velocity of Autumn stars Academy Award-winning actress Estelle Parson as Alexandra, a 79-year old artist who lives alone in a brownstone in the Park Slope section of Brooklyn and has reached the point where she can no longer live independently. Her co-star is Tony Award-winning actor Stephen Spinella, who portrays her long-absent son Chris who returns to New York after several years to act as a mediator between Alexandra and her other children who want her to move to an assisted living facility. Resentment and ridicule by Alexandra toward Chris for staying away from the family for so long in the beginning of the show slowly changes into something else as the two reminisce about life experiences. The panel of appraisers would provide their estimates in writing to the District and Akridge by Oct. 14. By Nov. 1, D.C. and Akridge are to have entered a definitive agreement to complete the swap and Lew plans to submit that — along with other Buzzard Point land agreements — to the D.C. Council by Nov. 15, which would give the council time to consider a stadium package before the end of the year. The land deals would close 30 days after council approval. Akridge owns the southwest corner of the stadium footprint. 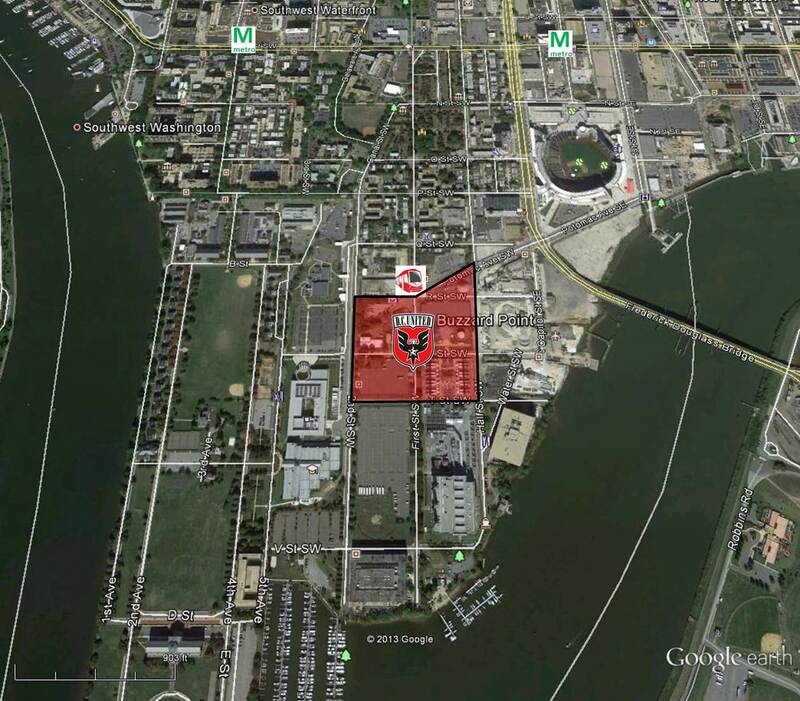 Akridge will maintain ownership of the rest of their 100 V Street site in Buzzard Point, which most likely has increased in value since the announcement of the stadium deal. According to the article, the date of valuation for the Akridge parcel has to be the day before the announcement of the stadium deal, so the appreciation of value isn't considered in the land swap. An aggressive timeline was set by the city and DC United to complete negotiations for the stadium when the two signed a term sheet back in July. 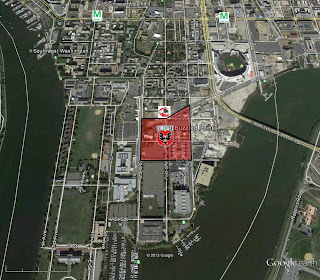 Since then, DC United has agreed to use union labor for large contracts to construct the stadium. The team hopes to play their first game in Buzzard Point by March 2016. 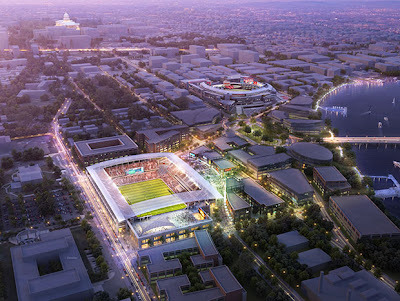 Update: A second article in The Washington Post mentions that the DC Council has been briefed on the stadium deal and has concerns, including the compressed timeline, whether revamping RFK Stadium has been thoroughly vetted, the land swap, and the tax abatement for the team. Over the next six months, the DC Office of Planning will be engaging Southwest residents and stakeholders to create a community led plan to guide the changes in the Southwest neighborhood for the next five to ten years. The Southwest Neighborhood Plan will focus on four key elements – people, parks, connections, and building. A Public Kickoff meeting related to the Southwest Neighborhood Plan was held on September 11th at Arena Stage. The meeting was well attended with people who live and/or work in Southwest. For the first hour or so, there was an Open House with different stations that allowed residents to comment about the benefits and challenges that exist in each of the four key elements of the neighborhood plan. Afterwards, Planning Director Harriet Tregoning and Ward 6 Planning Coordinator Melissa Bird gave a presentation about the planning process and entertained questions from the audience. 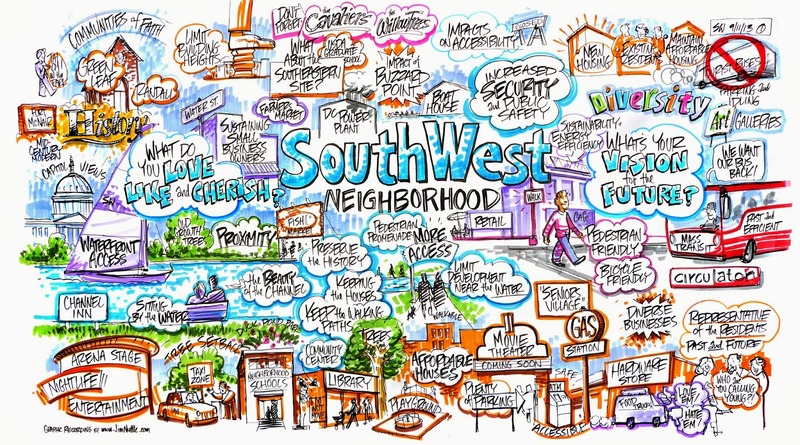 During Tregoning’s presentation, she mentioned that some of the values Southwest residents expressed to her during the Open House portion of the meeting include diversity, green space/tree canopy, and the library. Following the presentation, the Open House resumed for another hour. Some of the participants at the Open House. During the planning process, the Office of Planning and their consultants will work with the community to analyze several components to help inform their recommendations for the Southwest neighborhood. First, they will assess the development potential for multiple underutilized District-owned sites. A number of underutilized District-owned properties are included in the study area, including Randall Recreation Center, the northeast parcel of Waterfront Station, First District headquarters, Lansburgh Park, the DMV inspection station, and the DCFD Repair Shop/Engine Co. # 7, among others. The team will create an urban design framework that promotes greater pedestrian access, improved neighborhood connectivity and increased multimodal transportation choices. A coordinated approach to public parks and public space improvements will be developed. Meanwhile, neighborhood conservation potential will be assessed to reinforce character in established residential areas. Finally, opportunities will be identified to enhance sustainability at a neighborhood-level. The Southwest Neighborhood Plan study area extends from South Capitol Street to Maine Avenue and from P Street to Interstate 395. 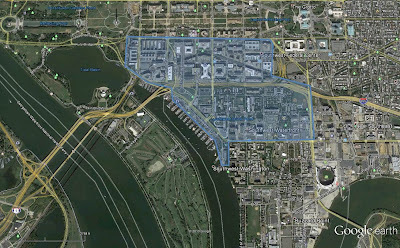 Within the study area, the portion from I Street to M Street is considered to be the primary focus area – where most of the development opportunities are located, as well as urban design issues. 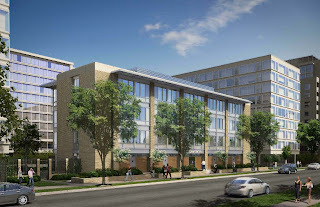 A portion of Greenleaf is also included in the primary study area, but a separate study will be conducted for that site as a part of the HUD Choice Neighborhood Planning Grant recently submitted by the DC Housing Authority. The remaining area is considered to be the secondary study area, where neighborhood conservation, neighborhood connectivity, and sustainability are the principal focus. The Office of Planning has created a project website and a second website called “Engage Southwest” where community members can interact. Other ways to participate in the process include using social media (use the hashtag #SWDCPlan on Twitter, “like” posts on Facebook, etc. ), submitting hand-written comments or questions at the public meetings, calling the Office of Planning at 202-442-7600, or sending an email to Melissa Bird. All of the comments from the Open House will be posted soon on the website. 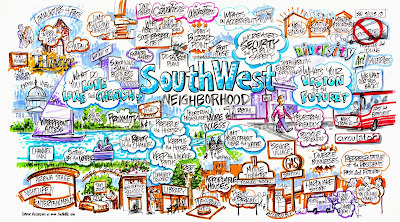 Not all Small Area Plans focus exclusively on real estate development – questions and comments from the audience at the kickoff meeting suggest that the Southwest Neighborhood Plan may include other components, such as teaching computer skills to seniors, helping break down barriers between longtime residents and newcomers, as well as other social improvements. September is the time of year in DC when several neighborhood festivals are held and Southwest will be hosting the third annual SW ArtsFest on Saturday, September 28. This year's theme is "Breaking New Ground" and the festival will include 10 venues throughout Southwest from 10 am to 11pm. All events are free except for a wine tasting event at Station 4. See below for a list of venues that correspond to the above map. Central Market (Grassy lot in front of Safeway – 4th and M streets) will have arts, crafts, food, exhibitors, interactive activities and live entertainment. Hand Dancing and Theater Tours (Arena Stage – 1101 6th Street) will include a panel discussion on The History of Lindy Hop and Hand Dance followed by hand dancing performances and workshops. There will also be guided tours of Arena Stage. SW Film Series, Performance Art & Yard Sale (Christ United Methodist Church – 900 4th Street) includes a feature film that explores the history of Southwest. In addition, there will be a performance art concert and a yard sale. Neighborhood Walking Tours (Waterfront Metro plaza – 4th and M streets) highlighting the following themes: Renewing Urban Renewal and Southwest Waterfront: From Watermen to Wreckers to “The Wharf.” Each tour will last 90 minutes each. Let’s Paint at the Duck Pond! (SW Duck Pond – 6th and I streets) Watercolor lessons and face painting for elementary school-aged children. Annual End of Summer Fair (St. Augustine’s Episcopal Church – 600 M Street) will include live music, arts & crafts, moon bounce & cupcake decorating. There will also be baked goods and other items for sale. Redskins tickets and other prizes will be offered at a raffle. Blues and Blowfish (7th Street Landing – 7th and Water streets) will include live blues and the ability to create blowfish as a work of art. Food and beverages will be available for sale. Virginia Wine Tasting (Station 4 - 1101 4th Street) will be held every half hour beginning at 11am. Seats are limited and registration is required. 12th Annual DC Jazz Preservation Festival (Westminster Church – 400 I Street) where crafts and food will be for sale. G40 Art Summit (Blind Whino SW Arts Club – 700 Delaware Avenue) will have 300+ pieces of art on display, along with live music and painting stations for all ages. For more information about SW ArtsFest, check out their website. 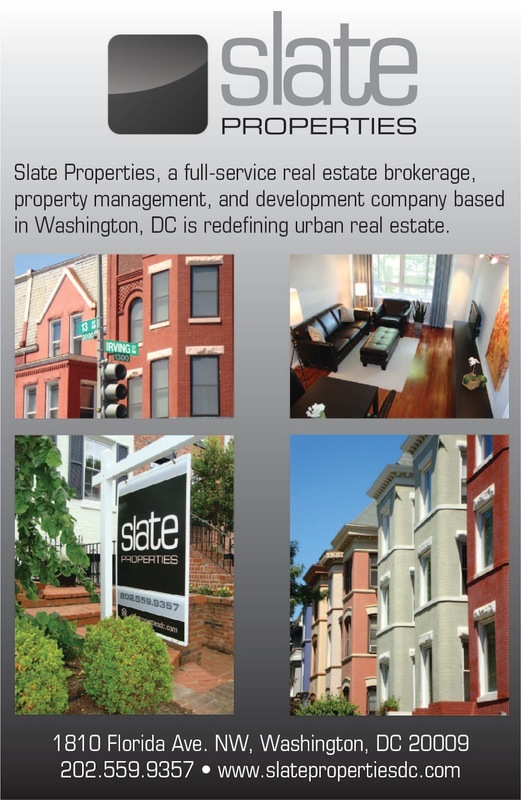 Legislation was introduced yesterday in the DC Council to create a new Business Improvement District in Southwest. Steve Moore from PN Hoffman, who has been spearheading the BID effort, came before ANC 6D this evening to seek their support for the creation of the BID. After some questioning by the commissioners, the ANC unanimously supported the BID organizers' efforts. 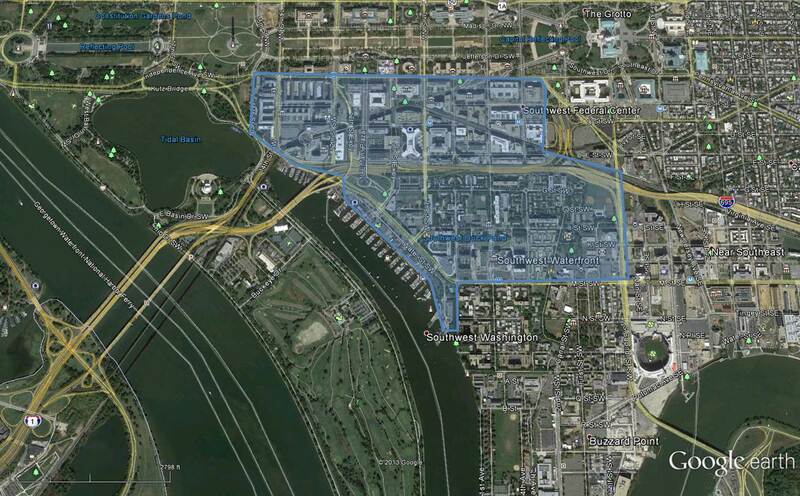 The rough boundaries of the SWBID are Independence Avenue to the north, 15th Street and Water Street to the west, Maine Avenue and M Street to the south, and South Capitol Street to the east. In order to fund the BID, there will be four classes of membership, each with their own set of fees: commercial property, industrial or unimproved land, hotels, and residential. The residential class includes apartment buildings with 10 units or more and the BID fee will be sent to the owners of the buildings. Condominiums, co-ops, town homes, public housing, and apartment buildings with less than 10 units are exempt, but will have the opportunity to opt-in if they want. Over the next year, there will be several initiatives undertaken by the BID, including an ambassador program; a "clean team", an inventory of public space; homeless outreach; creating a transportation network; a merchandising plan to attract and maintain businesses; creating special events; developing an identity for the BID; and keep stakeholders updated on progress made by the BID. If the DC Council and the Department of Small and Local Business Development approves the BID creation, services could begin as soon as the spring of 2014. If you are interested in an individual plot, sign up by tomorrow (September 11) by calling 202-417-8577 or email and give your name & phone number for the drawing. The drawing will be held on Thursday, September 12 at 7pm at Lansburgh Park. There is no need to be present at the drawing in order to secure a plot. Residents of Greenleaf, James Creek, and Syphax Gardens will have priority for 4 of the plots. Storage shed at SW Community Gardens. Another option for those who can't commit much time to their own plot is to join the Garden Crew. The Garden Crew shares 10 garden plots and work together to take care of the plants and teach people about gardening. The produce grown will be distributed among garden crew members and the community in general. Those who are interested in this option can call the number listed above, send an email, or visit the SW Community Garden Group website. Map of recent and planned improvements to Lansburgh Park. 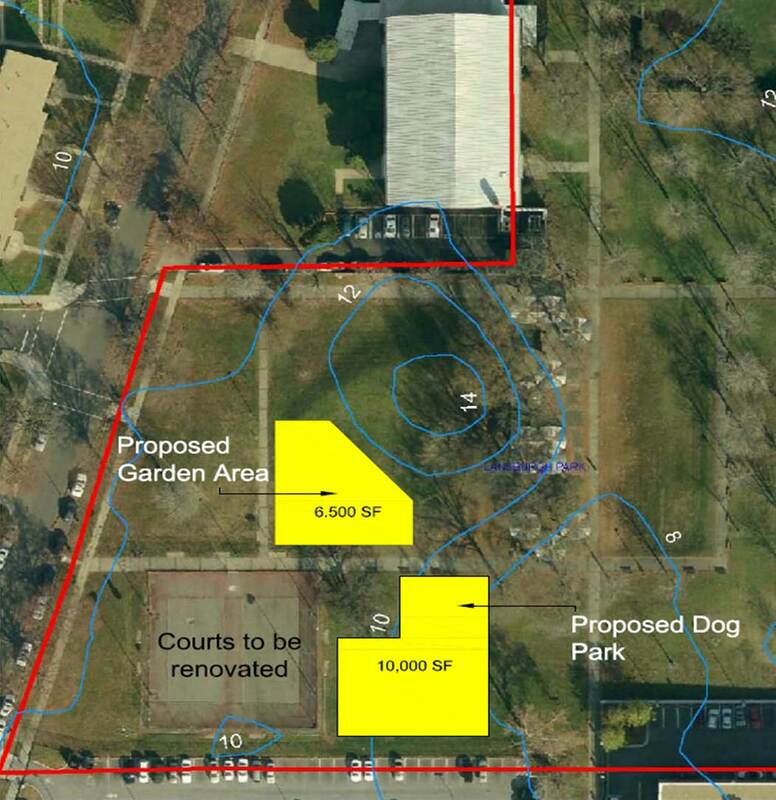 There will be a Meet and Greet event this Sunday at Lansburgh Park that will be co-hosted by the SW Community Garden Group and PAWS of SW, the group that's bringing a dog park next to the community garden. The Meet and Greet will be be from 11am to 2pm. Tours of the gardens will be available as well as an obstacle course for dogs. Gardening and dog skills demonstrations will be presented throughout the event. There will be a special appearance by Sam the bloodhound, MPD's newest detective. Light refreshments will be served. 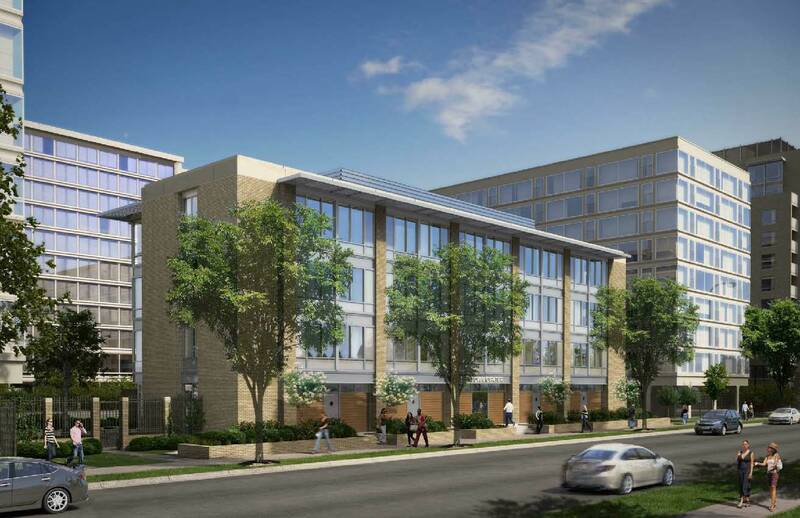 At tonight's ANC 6D meeting, the commissioners voted 4-0-1 to give conditional support to the Town Center East PUD. Several changes have been made to the project by The Bernstein Companies as a result of the ANC's last vote back in May to not support the PUD. Also since the last vote, the original I.M. Pei buildings and open space on the site have been designated historic by the Historic Preservation Review Board. As a result, the project now needs approval from the HPRB in addition to the Zoning Commission. The proposed center building has been removed from the project. The metal fence on top of the wall along 3rd Street has been removed. One foot of sidewalk along 3rd Street will be removed to add green space. Usable balconies have been removed from the new buildings and replaced with juliet balconies. The balconies will have frosted glass panels three feet, six inches tall to provide some privacy. The motor courts on the west side of the new buildings have been reduced a bit in size. More fenestration will occur on the 3rd Street edge of the new buildings, which uses more glass and more closely matches the window style of the Pei buildings. A more simple brick will be used since the increased fenestration results in less brick on the buildings on 3rd Street. The courtyard will have more green space. Some ideas have been presented for improved accessibility for Waterfront Tower residents with mobility issues. Discussions are underway for signage for Waterfront Tower, including pylons and numbers on the building. A lighting plan has been developed with a variety of options, including overhead lights, lower bollard lights, uplighting of trees, etc. Older rendering from M Street. 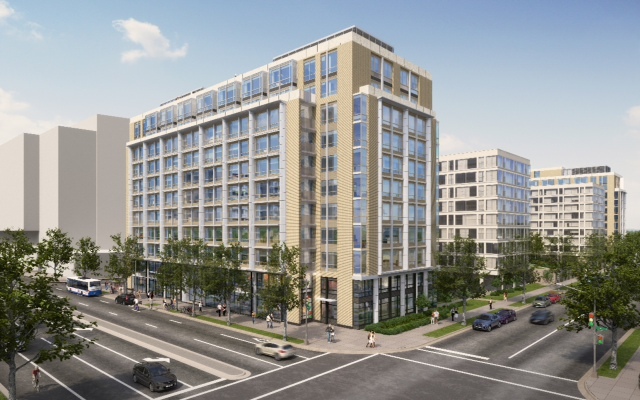 Revised rendering from M Street. The Waterfront Tower Home Owners Association is still not satisfied with the changes made and the lack of meetings between the developer and the HOA. Several homeowners were present at the meeting to express their concerns. Representatives from SWNA were also at the meeting and stated that the revised design is not worthy of being next to the historic I.M. Pei buildings. 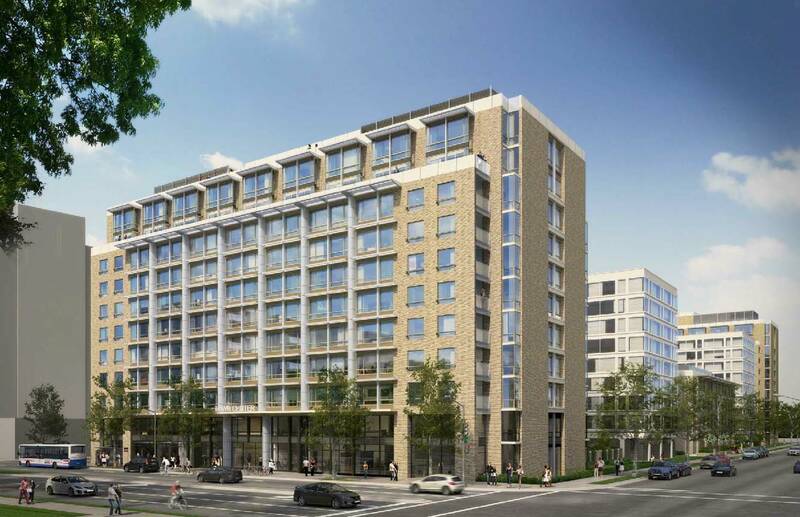 The ANC's conditional approval of the PUD is contingent on the developers addressing a variety of concerns to the satisfaction of the ANC before the October 7 Zoning Commission meeting. From September 13 to October 6, the G40 Art Summit will be held at Blind Whino SW Arts Club, the new arts club located at the former Old Friendship Baptist Church at 700 Delaware Avenue. Last year, the exterior of the former church was wrapped with a mural by Atlanta-based artist HENSE. In addition, the interior has a large mural created by Aussie artist MEGGS. The building has two levels – on the first floor, there will be several project rooms where artists can do full scale art installations as well as a DJ lounge area and exhibition space. The entire second floor will have a performance area that can accommodate up to 600 people. Blind Whino SW Arts Club will offer free art classes and events. G40 is an exhibit featuring over 500 artists and 1,000 works from around the globe. This year’s theme is the “Art of Transformation” and the exploration of reclaimed spaces and objects. These will range from using found objects to create art installations, to transforming the space using artwork. The exhibition will be open Thursdays & Fridays from 7pm to 11pm, Saturdays from 12pm to 11pm, and Sundays from 12pm to 6pm. A VIP event will kick off the art summit tonight. NBC 4 reported last night that there was a double shooting on the 200 block of K Street at Greenleaf Gardens, which occurred around 9pm. One of the victims, a male, passed away at the hospital, while the female victim is expected to be ok. DCHA is applying for a HUD Choice Neighborhood Planning Grant for Greenleaf, a public housing complex built in 1959. Below is a video from last night's 11 o'clock news about the shooting.